Biscuithead and the Biscuit Badgers' Tiers of Fandom! 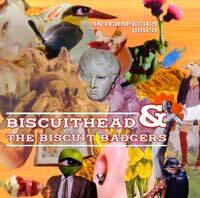 You've discovered Biscuithead & the Biscuit Badgers and you've had a listen to our wonderful music. Now's the time for you to become a fan. 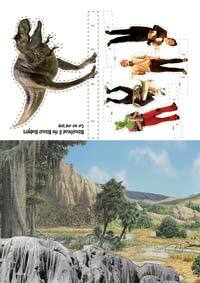 There are myriad (well, eleven) tiers of fandom to which you can aspire. Tiers to suit all pockets and all levels of fanatic zeal. Tier number one is free. Put yourself on the mailinglist and you'll never miss a gig. and if you get bored with us you can come off the list whenever you like. you're already on the list and you'd like to commit a little more. you're on the list and wearing your badge. Now it's time to buy a CD. 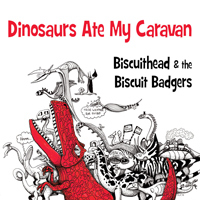 Our albums, Dinosaurs Ate My Caravan (pre-release copies), Interspecies Disco and The Greatest Show on Toast are only £5 each. you're wearing your badge and listening to our music but there are relatives overseas who you must inform of our biscuity goodness. and when you've made a scene with your cut-out biscuit badgers send us a photo for our gallery! you love your action figures but context is all. 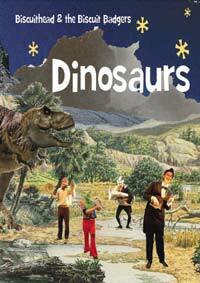 you're playing with your diorama and listening to our music, but your bedroom wall is bare. £2, but they're a faff to post, so come to a gig and buy one! 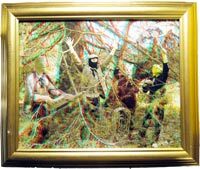 the poster is on your wall, you're listening to your CDs and playing with your diorama and they're all lovely, but how to replicate the live experience? You need a 3d photograph. 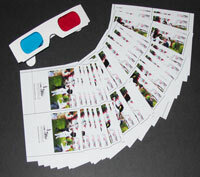 We also do a 3d photographic poster - 45cm x 30cm with a pair of 3d glasses. It's like we're really there - only smaller. They're £3 but a faff to post, so ask us at a gig. The man said that it's solid gold but we suspect it might be mdf under a layer of golden spray paint. Comes with 2 pairs of 3d glasses. Tier number nine is free! Sheet Music and performing it to your friends.. 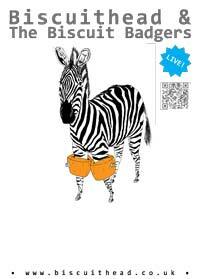 It's 50 pages long and contains all the songs from the album with the tune, the words and ukulele chords. is the absolute pinnacle of fandom. 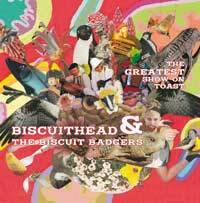 Buying this item will mark you out as a true and loyal fan of Biscuithead & the Biscuit Badgers. This item is a unique piece of band merchandise and no other band in the world will offer it to you. 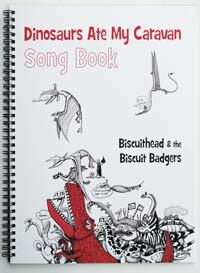 Each one is lovingly collated by a member of the Biscuithead & the Biscuit Badgers rhythm section. 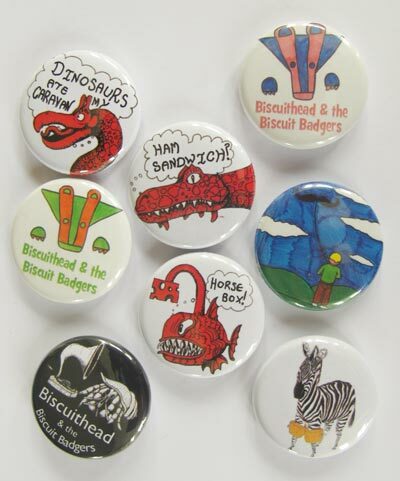 It comes in kit form and contains photos, card, 3D glasses - everything you need to make your own Biscuithead & the Biscuit Badgers 3D flipbook - all you need is glue, scissors and a couple of clothes pegs. Once you have your kit just click on the instruction video button and Sam will guide you through the joyous assembly process.